I know of no better place to posit a question of this kind. After years of historical interest, and recent months of research, I’m wanting to jump into the living history scene. I’ve already got a decent collection of weaponry across the ages, but want to begin piecing together a late Viking/Early Norman kit. Also of interest to me is the 13th century era of the military orders (particularly Hospitallers and Teutonic Knights). The mail of these kits have considerable overlap - and I’m trying to determine if I can use one set of mail (and maintain historical integrity) as I piece out further elements for both kits. My biggest hang up at this point is sleeves. It seems to me that much of the late Viking/early Norman mail was not full sleeved...but by the time we get to the military orders mail was most commonly full sleeved. With that in mind, is it historically plausible that full mail sleeves (round ring riveted) were present (if not common) in the late Viking/early Norman period? I think elbow-length sleeves will give you the most versatility regarding different time periods. You would want mail made from alternating rows of round riveted and solid links. There is nothing on the market that looks remotely like the links that were used so you'd need to make your own. If you aren't comfortable making your own riveted mail then IMO you can get a very good approximation of the appearance of this kind of mail by using alternating rows of butted and solid links. The end result looks a lot better than the mass-produced riveted links that are commercially available today. Keep in mind that the commercially-available mail has links that are too large for most kinds of historical mail. The manufacturers of these links use the INSIDE diameter when telling us how large they are while archaeologists and museums use the OUTSIDE diameter. What the manufacturers call "6 mm mail" is really 10 mm or more. 1. 16 gauge seems to be the modern size equivalent of “typical” period size (I hate to say that, but can’t come up with a better way). What are your thoughts on this? 2. Any suggestions or words of wisdom on how to make up for the lack of forearm mail when transitioning kits? 1. Can't help you with gauges. I only work in metric. 2. Historically, forearm armour was rare. You don't need it for Living History. Good to know. I haven’t seen much period art depicting haubergons in the military order years, but I have found some. Much more showing full sleeves of mail, but perhaps in the late Viking/early Norman years full length sleeves were just not around. Not sure about this. My preference would be to have full sleeves, and I would like to believe that full mail sleeves were around in those years, but I have no proof. Again, doesn’t mean it didn’t exist, just that I don’t have proof of it. In the period you are referring to (appx. 11th century), you would only see short sleeved maille armour. Look to sources from the time period (carvings, art work), or directly after it (Bayeux Tapestry) to see examples. You can even use a short sleeved byrnie in the mid-13th century, until you can afford to make or buy more mail. Portray a serjeant rather than a knight, and upgrade equipment as you go. Thanks Mart. I had looked these up earlier as a matter of fact. Manuscript Miniatures is most certainly handy! As I noted earlier, I like the long sleeves better due to the application of the Hospitaller kit...but it appears if I'm wanting to use the hauberk for both applications, I'll need to go 1/2-3/4 sleeves to maintain more authenticity. Now a followup question - in this art it appears that their forearms are only covered by gambeson, or tunic. Dan has already mentioned that forearm armor was rare in this period. In the Viking/Norman era it appears that a gambeson was the only forearm protection worn. Do we know of anything else that might have been used with a byrnie during the crusading era, or again, just gambeson? In the Viking/Norman era it appears that a gambeson was the only forearm protection worn. Do we know of anything else that might have been used with a byrnie during the crusading era, or again, just gambeson? You won't find documentary evidence for aketons or gambesons until roughly the last quarter of the XII century, so not until after the first two numbered Crusades. 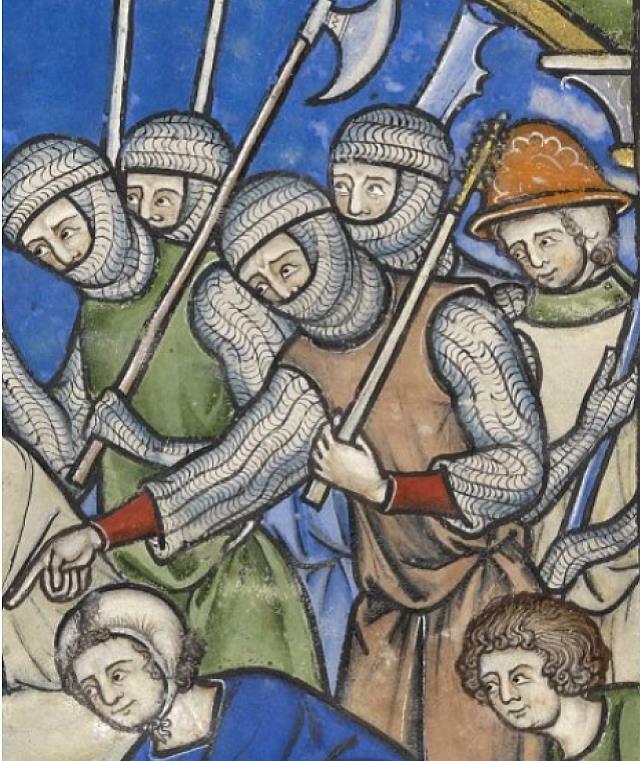 The only other arm defense for the rest of the Crusades is mail for the western Europeans, although it's possible some early form of couters showed up for the elite by the last Crusade. There's always the shield. Dan has already mentioned that forearm armor was rare in this period. Forearm armour was rare in ALL periods from the Bronze Age onwards. It was mainly the elite who seem to have bothered with it. My guess is that it was difficult to make forearm armour that stayed strapped in place unless it was attached to a full arm harness.